In the early part of this century, the discovery of a walled-up cave in northwest China led to the retrieval of a lost early Ch'an (Zen) literature of the T'ang dynasty (618-907). One of the recovered Zen texts was a seven-piece collection, the Bodhidharma Anthology. Of the numerous texts attributed to Bodhidharma, this anthology is the only one generally believed to contain authentic Bodhidharma material. 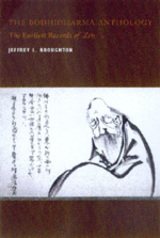 Jeffrey L. Broughton provides a reliable annotated translation of the Bodhidharma Anthology along with a detailed study of its nature, content, and background. His work is especially important for its rendering of the three Records, which contain some of the earliest Zen dialogues and constitute the real beginnings of Zen literature. The vivid dialogues and sayings of Master Yuan, a long-forgotten member of the Bodhidharma circle, are the hallmark of the Records. Master Yuan consistently criticizes reliance on the Dharma, on teachers, on meditative practice, and on scripture, all of which lead to self-deception and confusion, he says. According to Master Yuan, if one has spirit and does not seek anything, including the teachings of Buddhism, then one will attain the quietude of liberation. The boldness in Yuan's utterances prefigures much of the full-blown Zen tradition we recognize today. Broughton utilizes a Tibetan translation of the Bodhidharma Anthology as an informative gloss on the Chinese original. Placing the anthology within the context of the Tun-huang Zen manuscripts as a whole, he proposes a new approach to the study of Zen, one that concentrates on literary history, a genealogy of texts rather than the usual genealogy of masters. Jeffrey L. Broughton is Professor of Religious Studies at California State University, Long Beach.